Finally, a unique solution to that age old problem of what to do with the pit after the olive has been consumed. Yay for the Double Dish. Age old problem?! You’re not Portuguese, are you?? This would also be a good solution for edamame. 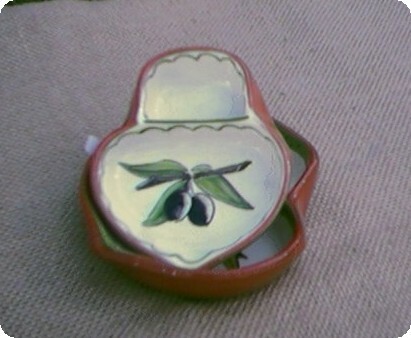 In portugal we have to dishes – one for the olives, and another one for what is left. But this is indeed a good & elegant solution! ALso absolutley brilliant for pistachios! (I don’t even know if I should right in portuguese or not! 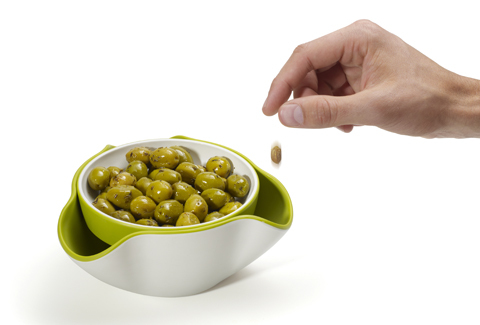 Very cool – like the way the collection bowl is deep enough to collect lots of pits or shells.